Harmon Orthodontics (Mitchellville) - Book Appointment Online! 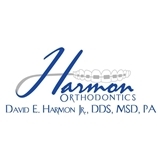 Welcome to the orthodontic practice of Dr. David Harmon, Jr. We exclusively specialize in providing orthodontic treatment to patients of all ages. Our practice is focused upon making the "patient experience" both a pleasurable experience and one that will be looked forward to. The treatment you will receive utilizes the latest in technology and the most advanced clinical techniques. Our focus is on you: the patient. We will make every effort to assure that you are well cared for and are kept abreast of each step as we venture through the treatment process. There is no greater reward for us than to see our patients' smiles transform into beautiful, and healthy smiles.